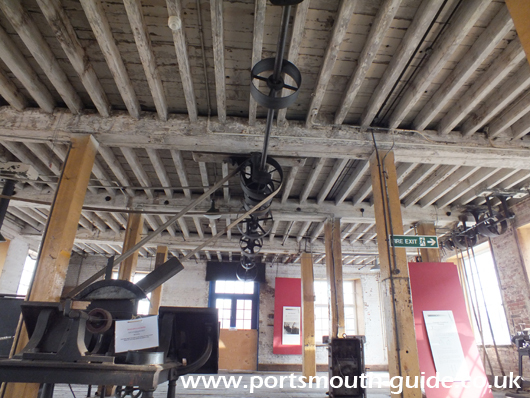 The Block Mills in Portsmouth Dockyard are not normally open to the public but are full of history. The Block Mills were built during the Napoleonic Wars to supply pulley blocks to the Royal Navy. The site is home to the first stationary steam engine used by the Admiralty and the mills kick started the age of mass production. The Royal Navy used a large amount of blocks at the time the block mills were built and at that time they were all hand made. This lead to the quality not being consistent and the supply was problematic and expensive. A typical ship of the line used around 1,000 blocks of different sizes and this lead to the Royal Navy requiring over 100,000 blocks a year. In 1802 Marc Isambard Brunel proposed a block making machine to the Admiralty and in August 1802 he was authorised to proceed. There were three series of machines to make the blocks each designed to make a range of block sizes. The machines were ordered into a production line, so each stage of the work progressed to the next in a natural flow. The yard between the two wood mills was walled off and roofed to form a new workshop to house the block making machines. The first set of machines to make medium blocks were installed in January 1803 with the second set of machines for smaller blocks in May 1803 and the third and final set for large blocks in March 1805. In September 1807 the plant was able to fulfil all the needs of the Navy and in 1808 it produced 130,000 block for the Royal Navy. The machines in the mill totalled 22 different types of machine with there being 45 machines in total and they were all driven by two 22.4KW steam engines. The machines included pin turning machines, circular saws and mortising machines. Using these machines 10 men could produce as many blocks as previously produced by 110 skilled craftsmen. The machines attracted a lot of attention from people such as Admiral Lord Nelson on the morning he was embarking for the battle of Trafalgar in 1805 and Princess Victoria as part of her education. The Block Mills have remained in Naval occupation ever since and therefore are not open to the public. The National Museum of Science and Industry in London was donated some of the machines between 1933 and 1951 and others are on display in Portsmouth’s Dockyard Apprentice Museum. In 2006 a project was started to ensure the building and its contents were preserved.